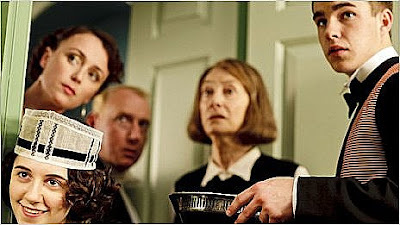 Watched very little over Christmas on terrestrial TV - thank goodness for DVDs and a backlog of recorded stuff - but made an exception for the revival of "UPSTAIRS DOWNSTAIRS" (BBC1). I was a massive fan of the original during my childhood so it brought back some good memories to get back again to 165 Eaton Place, and in a nice touch Rose from the original series returned as housekeeper. And Newt from Hollyoaks even turned up as one of the 'downstairs' staff. Aww! During my blog break I've had the opportunity to catch up on some movies. As a child growing up in the 1970s, I remembered the names Baader-Meinhof always seemed to turn up on news bulletins, although I was too young to understand what it was all about. 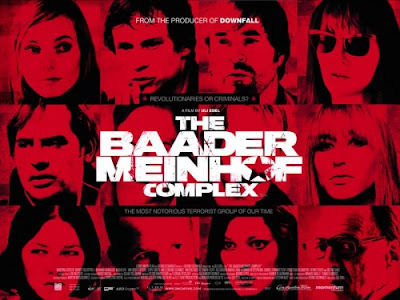 "THE BAADER MEINHOF COMPLEX" (Sky Movies) didn't really provide too many answers, apart from going down the obvious route of "one man's terrorist is another man's freedom fighter". It was a good enough film, but a little disjointed and didn't really explain or give the back-stories on the main protagonists and their followers. "UP IN THE AIR" (Sky Movies) was quite different from the usual modern film fare. 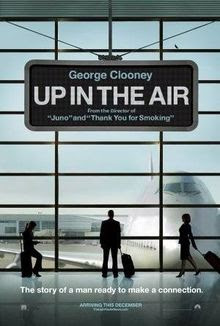 It starred George Clooney as a man who spends his time going from one part of the country to the other, firing employees for other companies, only for him to find love and discover that no man is an island. Good film, although with a rather regretful ending. "THE PROPOSAL" (Sky Movies) was a reasonable enough romcom, although it has to be said I'm no fan of that particular genre. It starred Sandra Bullock as a frozen-faced publishing executive being punted back to Canada because her visa was running out. Cue predictable green card scenario as she plans a fake marriage to her assistant. You can guess the rest. Yes I did say it was predictable, but it had some funny moments and wasn't too bad. Matt Lucas also popped up in "ALICE IN WONDERLAND" (Sky Movies) which we weren't originally going to watch but had to check it out anyway. 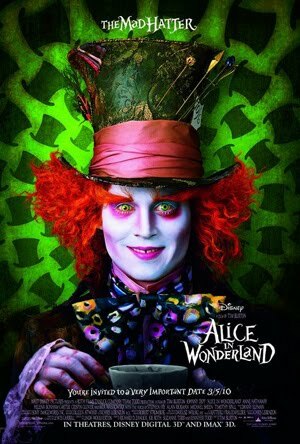 Two words: Johnny Depp. One of the things we love about Johnny - and there are many, many things we love about Johnny (!) - is that he's not afraid to take on movie projects which make him look totally ridiculous. Which, being the world's most beautiful man, is some achievement. The film itself was a colourful and reasonably accessible adventure, and better than we expected. "AWFULLY GOOD TV" (Channel 4) was, for once, a TV show which lived up to its title - where bad TV definitely made good TV, topped off with some devilishly deadpan voiceovers by David Walliams. A refreshing change from the usual clip shows with commentaries by Z-listers. Although I usually make an exception for "THE MOST ANNOYING PEOPLE OF..." (BBC3) which is always an annual end-of-year must-see, thanks to its clever voiceovers by Richard Bacon and a slightly higher calibre of Z-listers offering their comments. It was good to see Matt Lucas and David Walliams back on our screens. "COME FLY WITH ME" (BBC1) is a spoof of those old docusoaps "Airport" and "Airline". It's very funny, but lacking some of the more side-splitting moments of the heyday of "Little Britain", which was one of my favourite comedy series ever - but thankfully also lacking some of the more gross-out moments which eventually dragged that series down in its latter days. The high point of this new series remains the "Martin Clunes" song - they haven't topped that one yet. Series 1 has now ended, but the good news is that it's been recommissioned for a second series. "THE SECRET MEDITERRANEAN WITH SIR TREVOR MCDONALD" (ITV) does what it says on the tin. The major surprise here being that there is finally something decent on ITV, and I never thought I'd see the day when those words would be uttered. So I guess we'd better make the most of it while we can. Basically it's Sir Trevor checking out some undiscovered stories from the countries which border the Mediterranean. It was a feast for the eyes and a very enjoyable series - I wonder if there will be more stories to tell? All Rise for the UK 2011 Eurovision entrants! After weeks of endless rumours mentioning everyone from Charlotte Church to Katherine Jenkins to Pixie Lott to someone-who-just-missed-out-on-X-Factor-boot-camp, the speculation about who would represent Royaume-Uni at the 2011 Eurovision Song Contest in Dusseldorf finally ended at midnight last night, when the BBC announced that our representatives would be the newly reformed boyband Blue. Blue had a lot of hits back in the day - between 2001 and 2004 to be precise. I always liked them, and "All Rise" and "Fly By II" were, and still are, big favourites here at EuropeCrazy HQ. All good things eventually came to an end though, and the band went their separate ways. Simon Webbe had a few hits and my favourite of these was "No Worries". Duncan James' solo pop career wasn't so successful although I liked "Sooner or Later" which should have been a hit (but wasn't). 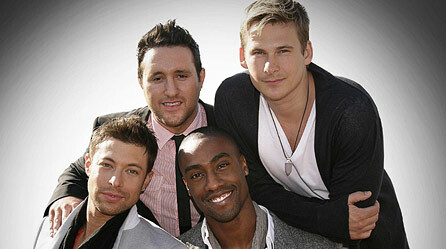 Lee Ryan also attempted a solo career, and had a few hit singles, my favourite of these was "Turn Your Car Around". And as for Antony Costa, well he even had a shot at representing the UK back in 2006 - but it was Daz Sampson who got the UK ticket that year. In the intervening years since splitting and reforming, the members of Blue have also gone down that well-worn route to staying in the public eye: reality TV. Duncan James appeared in Dancing on Ice, Simon Webbe in I'm A Celebrity, for example. Of all the band's members, Duncan James has probably been the most successful, as he has now established a new career for himself in musical theatre. In recent years many boybands have reformed on the back of the Take That phenomenon, with varying results. Reforming a band can be a massive risk, but it's even more risky when your comeback will be played out on the Eurovision stage. This is the first time ever in the history of the UK's participation that the BBC has gone for a full internal selection, of both the artist and the song so let's hope that the gamble pays off. Two years ago the efforts put into promoting "It's My Time" paid off with a 5th place, however all the good work was undone last year as poor Josh Dubovie was thrown to the slaughter with a song which would have been old-fashioned even 20 years ago. The problem with the UK's entries is that the BBC is stuck in the past. The Beeb still thinks that Eurovision is all about the boom-bang-a-bang type songs which died out a long long time ago, whereas Eurovision has moved on and become more contemporary - last year's winner "Satellite" is a very good example. If the UK was to send a "contemporary" entry it would probably look like Taio Cruz featuring Tinie Tempah, with N-Dubz and Katy B on backing vocals. But there would be no chance of that (not that I'd want that type of entry anyway). So I guess that the choice of Blue as the UK's representatives this year is as contemporary as the BBC will probably get. It's also a very smart choice, considering that the band were very popular in Europe back in the day - particularly in Italy, if I remember rightly - and their solo singles also did well; I remember whilst on holiday in Krakow in 2006, Simon Webbe and Lee Ryan's songs were never off the radio. So there's that recognition-factor to start with, which may just lift us off the bottom of the voting table. It will be all about the song of course: it's called "I Can" the title of which is worryingly reminiscent of an "I Believe I Can Fly"-type anthemic ballad. But we'll have to reserve our judgement till we actually hear the song. There's no info on when we'll hear the song for the first time, but according to www.bbc.co.uk/eurovision a documentary will be screened in April about the band's preparation for the contest, including them promoting the song in Europe. So maybe they'll turn up at a few national finals, just like Jade Ewen did in 2009. Anyway, I'm quite happy with the choice of Blue, and I'm sure they will do their very best. They sing well and are established performers, so let's just hope they do us proud in Dusseldorf. I've been a big fan of mash-up mixes over the last few years. When they succeed, they manage to completely reinvent a song and give it a whole new interpretation. I know it's old news now, but I really wanted to write a post about one of the best mash-ups in a long long time: the marriage of Oskar Linnros' "Från och med du" and Robyn's "Dancing On My Own". The idea isn't a new one of course, as Oskar had covered Robyn's hit during his autumn 2010 tour, before leading into his massive summer hit. Now Patrik Berger has taken it a step further and mashed up the two songs, with Robyn singing over Oskar's backing track. The bittersweet rejection and regret of the original now becomes a good-riddance celebration set to the upbeat, feelgood backing track. To me, it now says: "I'm giving it my all, but I'm not the girl you're taking home....but do you know what? I couldn't care less. F*** you! I keep dancing on my own, and I'm very happy about that, thank you very much." Maybe that's just my take on the whole thing, but I really was blown away by how this song dramatically changed, just by putting a different backing track to it. I'd previously featured this next mash-up over at Planet Salem a couple of months ago but while I'm on the subject of mash-ups, my thoughts inevitably turn to a recent mix of Axwell and Ingrosso featuring Salem Al Fakir's "It's True", and Kylie Minogue's "Get Outta My Way" which I think is a pretty successful mix. There have been many many dance remixes of "It's True" over the last 3 years, and the song just refuses to go away. Not that I would ever want it to, of course!! :) This mix is by Ben Double M.
Finally, let's go further back in time a few years to one of my most favourite mash-ups ever: Shakira's "Whenever Wherever" mixed with the Bee Gees' "Stayin' Alive" and some Britney "Slave 4 U" thrown in for good measure. I never get tired of this mash-up, although faithful travelling companion thinks it's sacrilege! Let me know if you've discovered any good mash-ups - particularly featuring Swedish or other European music. Francophone Song of the Year: M. Pokora - "Juste Une Photo De Toi"
International Song of the Year: Shakira - "Waka Waka (This Time for Africa)"
Music Video of the Year: Lady Gaga & Beyonce - "Telephone"
So...shamefully I've been out of the loop as far as French music goes, over the last couple of years so many of the nominees didn't really mean anything to me. However I'm very familiar with the names of the winners...Matt Pokora is still as popular as ever. Although "Juste Une Photo de Toi" is OK I guess, it doesn't excite me in the way that, say, "Elle Me Controle" or "Dangerous" did (and still do) but that's probably more to do with the fact that I'm really, really, REALLY fed up with landfill r'n'b - in any language - please make it stop! Although I'd probably take Matt over all the British rubbish if I had to choose. Very happy for Jenifer though, even though she beat my all-time fave French female Mylene. Talking of whom, she made her long-awaited appearance tonight - but why did she have to spoil it by miming? At least Jenifer sang live! Oh, and major points deducted for those awards to the Black Eyed Peas - a band I used to like, believe it or not, but now I hate them with a passion. 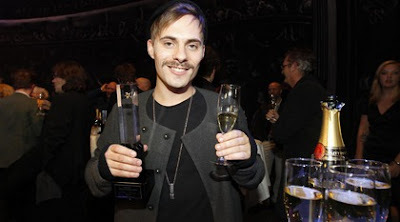 Grammis 2011: it's all over, and here's who won. Årets album: Robyn: "Body talk"
Årets låt: Robyn: "Dancing on my own"
Årets folkmusik/visa: Blandade artister - "Sonja Åkesson tolkad av"
Above: Oskar Linnros (and his new moustache) celebrate being named the year's best newcomer. And deservedly so! So....I'll be posting my thoughts over the next couple of nights, as I don't have much time to write my full post just now. Of course anything I'm going to write about the Grammis will inevitably be clouded by my own taste and judgement, and regular readers will know what I'm going to say: no awards for Salem Al Fakir, which was incredibly disappointing for me, although I don't think the man himself will be too bothered as I remember a quote from him in the past that he "doesn't make music to win awards". But the recognition would have been nice nonetheless. At the time the nominations were announced, I was pretty stunned that there were only two nominations - for best male artist and best song. At the same ceremony 3 years ago, the same singer received a whopping 9 nominations and took home 4 awards. At that time he was critically acclaimed and reasonably well-known, yet not a household name. When we fast-forward three years, something changed. Salem became that household name thanks to his "great experiment" i.e. appearing in Melodifestivalen. He released a reasonably experimental third album, but it would appear that the nominating committee took the advice of that album's title, "Ignore This" and did just that. The message here would appear to be, 'appear in Melodifestivalen and say goodbye to a Swedish Grammy'. So enjoy your moment, Lasse Stefanz, for it may not come again...!! For like all music awards ceremonies, the Grammis would seem to be more about the critics' favourites rather than what's popular. Or indeed, what's "pop" - thank goodness we have the refreshing alternative of the Scandipop Awards for that! Yet it's also an award ceremony full of contradiction. 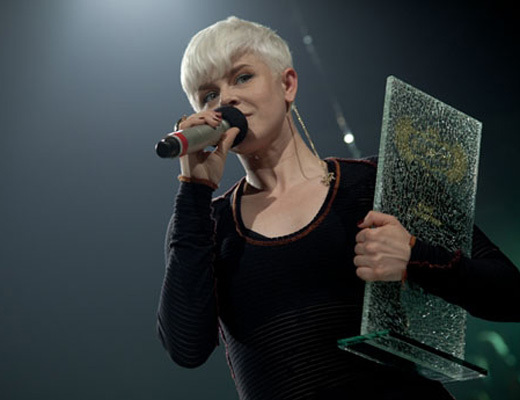 For all the bias towards the "credible" artists/lyricists, many of whom write and sing in Swedish, this year's big winner was an artist who writes and sings in English, and who is both commercially successful and a critics' fave. That's probably the big difference between Sweden and Britain: Sweden is proud to celebrate its artists' successes, particularly beyond Swedish borders - so that award for the ubiquitous RedOne is no surprise - whereas in Britain, when you become successful, the media turn against you. Another artist who is loved by the critics and is hugely successful at the same time, is this year's triple-winning Håkan Hellström. Despite this, he has never really appealed to my taste although I can understand his crowd-pleasing popularity thanks to his anthemic rock singalongs. A major shock in the 'best group' category, I thought - the seemingly unstoppable Kent, who made one of their best albums in years, being beaten by the relatively new but very promising Johnossi. I guess this is maybe a sign that the awards jury are looking to the future rather than the past? Happy to see Donkeyboy win an award in the international category. I didn't know they had this category in the Swedish Grammis, as I thought it was just for Swedish artists and when I saw the result at first I was rather puzzled by this, as the last time I looked, they were Norwegian! I would have liked to have seen Oskar Linnros win more than one award - and indeed, I'd have liked Daniel Adams-Ray to win one too. Oh well I guess there just weren't enough awards to go round :)) but seriously, the competition was very strong this year and whether or not you agree with the winners, you can't deny that Sweden has such a strong and varied music scene that there is something for everyone. So, even though my favourite artist didn't win anything, I was still very happy with most of the winners and almost all of the nominees. Congratulations to all the winners! Eurovision 2011 national finals season has been underway for a while and Albania, Switzerland and Romania have wasted no time in choosing their entries. Not that easy (Ah-åh-ah-åh) - Åste & Rikke - one of them looks a little bit like Maria Haukaas Storeng, but the whole thing on first listen was very forgettable. Vardlokk - Helene Bøksle : this was the pre-contest favourite but the end result was basically a piece of meaningful atmospheric mince in search of a decent song. If you like that girl-in-a-floaty-frock thing, Christine Gulbrandsen did it much better in 2006 with "Alvedansen". Major disappointment. Daisy - Use Me: their haircuts were just a little too Justin Bieber for my tastes, but I guess there's still an audience for this Fall Out Boy-style rock/pop with teen appeal. Alt du vil ha - Sie Gubba: Norsk dansband with fiddles. Not really my thing. Over to ICELAND now, where the first semi-final took place tonight: "Ástin Min Eina" by Erna Hrönn Ólafsdóttir (a nice ballad sung by a good singer) and "Ef Ég Hefði Vængi" by Haraldur Reynisson (easy going but forgettable acoustic-rock song) are through to the final.